Are you looking for color ideas to paint your living room? The standard white color is the most used, but in this article you can see other examples of colors that can be a good choice to color your space. We share the wall colors that are trends in Interior Design in 2017. Enjoy our beautiful and mesmerizing suggestions of Living Room Wall Painting Colors 2017 that will inspire you at the time of painting your walls. Gray and white are a timeless combination that harmonizes with both modern and elegant spaces. When using neutral tones, you can choose to add touches of color through the accessories. Project designed by Koket. The color of the wine is a good choice for the contrasting walls. It is an elegant color that looks wonderfully with furniture of a neutral tones. Another bold color is the red that has the power to ensure an immediate energy. The ideal is, however, to balance it with furniture and white details to create a contrast. Try to paint the ceiling with a lighter color than the walls, to make it appear taller and, in space, larger. The pastel shades are the main protagonists in the latest proposals for decoration this year. They can appear in the pictures and repeat themselves in the rest of the space, elevating the decoration. 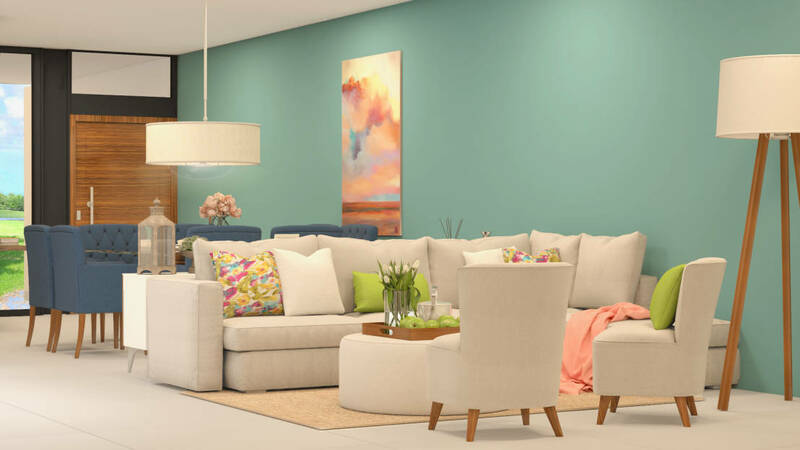 As you can see, in this modern living room, only a few walls appear painted in stronger colors. There are walls that materialize strategic points within the space and appear as a statement in the home decor. Much is said about the risk of using dark colors in the spaces, but when properly applied, they can look fantastic. We love this combination of navy blue with touches in white. With white color, you can take a monochrome approach that extends from the floor and walks through walls, furniture, and curtains. And so you get a space full of light and creates a lot of tranquility.